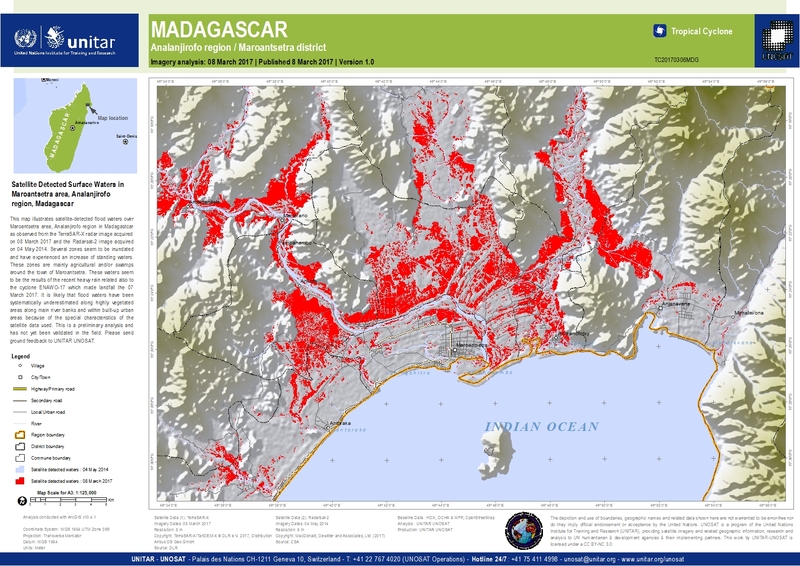 This map illustrates satellite-detected flood waters over Maroantsetra area, Analanjirofo region in Madagastcar as observed from the TerraSAR-X radar image acquired on 08 March 2017 compared with to a Radarsat-2 image acquired on 04 May 2014. Several zones seem to be inundated and have experienced an increase of standing waters. These zones are mainly agricultural and/or swamps around the town of Maroantsetra. These waters seem to be the results of the recent heavy rain related also to the cyclone ENAWO-17 which made landfall the 07 March 2017. It is likely that flood waters have been systematically underestimated along highly vegetated areas along main river banks and within built-up urban areas because of the special characteristics of the satellite data used. This is a preliminary analysis and has not yet been validated in the field. Please send ground feedback to UNITAR UNOSAT.